I've been asked several times about what iPad accessories are necessary for teaching. I've been reflecting on this, and must first start by saying that there is a lot of personal preference involved. The answer to the question changes depending on what subject you are teaching, what level you are teaching, and how you use your iPad to support teaching. Personally, my list of iPad physical accessories for teaching includes: stylus, VGA connector, and MacBook Air. In addition, I have a couple of apps that I find necessary for the workshops and presentations I give, specifically: Reflections/AirServer and Screencast-O-Matic (on my Mac). Below is a description of how I use each of these. I was an early adopter of the iPad stylus, searching out early versions and buying them in a variety of styles as the market tried to figure out what would work. This is a bit of a hold over, as I used to have a Tablet PC (which I loved). Since I use the iPad for note taking, taking margin notes when I do literature reviews, and I would use it for marking if I taught a course that required that type of marking, see Using the iPad to mark student papers, the stylus is critical for me. There are now many different styli available, and the market is changing on a regular basis. They haven't perfected it yet (for a good summary review see http://www.theverge.com/2012/4/10/2925937/best-stylus-ipad-review). The issue with the iPad stylus is that you need to think of it as writing with a marker rather than writing with a pen. The capacitive screen can't tell how much pressure you are using. But I hear that Bluetooth 4 enabled styli can detect pressure, and as support for them increases, and more models become available, the price will drop. I anticipate that within the next year, we'll be using iPad styli in a very different way than we do today. 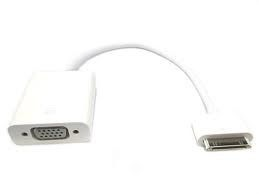 I bought the VGA connector for my iPad shortly after I bought my iPad2, so that I could use my iPad to do a presentation in class. I quickly discovered that the connection it makes is not particularly solid. The connection on the iPad has no way to screw into the device, and Smartboard cables can be very heavy. This means the slightest bump in the iPad causes the iPad to loose connection to the projector. If feasible, it is better to connect wirelessly, but this to has its challenges, see Presenting with the iPad – Part 1 Technology Overview. Yes, it is amusing, but I did indeed buy my MacBook Air specifically as an iPad accessory. I purchased the MacBook Air so that I could setup Ad Hoc networks in order to project wirelessly from my iPad (see Presenting with the iPad – Part 2 Setting up an Ad Hoc network). I looked into other solutions (a combination of Airport Express, Apple TV, and HDMI/VGA converter), but that involved too many parts, and the weight quickly began to add up. Now, I bring along my MacBook Air when I need a little more funcationality than my iPad can give, and I use it when I need a predicatable way to connect to a VGA projector (note, VGA cable is required). Reflections and Air Server are two applications that provide iPad mirroring to the desktop or laptop. They both work on Mac or PC. I use one of these in combination with an Ad Hoc network on my MacBook Air in order to project what is on my iPad screen wirelessly. In combination with Reflections, I use screencast-o-matic to record iPad tutorials for this blog and for people that I coach in using the iPad. The combination makes it really easy to do quick tutorials with either the iPad or iPhone. For an example see: Using Siri to take notes on my iPhone. So far, that is my list of must-have accessories for teaching with the iPad. Note that I have not listed a keyboard as an accessory for teaching. I use my keyboard for authoring and blog posting, but not really for teaching. If you do really feel the need for a keyboard, I recommend getting one that integrates with the case, so you aren't needing to carry two things around, see Keyboarding your iPad: Best Keyboard Cases. For everyone who teaches with iPads out there, what are you must-have accessories?